Fire Engines Archives - Mamanista! Wooden cars are a classic toy that continues to delight, no matter how many new electronic toys bombard our kids with flashing lights. 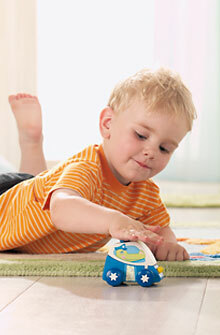 HABA has a fresh new take on this toddler favorite: a mini vehicle, available as a police car or fire truck, with a colorful cartoon animal driver and a button-plunger “squeak” to complete the fun.